To introduce you to Amora ultra-premium coffee. We invite you to accept two bag for free. Just pay $8.95 shipping and handling. 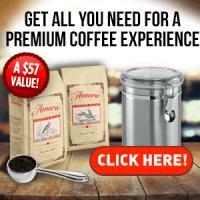 We will send your subscription starter box which includes 2 bags of Amora coffee (your choice of blend, grind and type), a silver-plated scoop, and our stainless steel air-tight canister. Wake up to Amora, the ultra-premium coffee that is roasted in small batches and delivered fresh to your home by 2-day Priority Mail. Choose from 8 Premium Blends.